Borderlands 2 is a great game. It’s also a fairly LONG game. I got it a little later than most, but I had a few decent sprints that allowed me to catch up with my gaming cohorts… which means within a fairly short time frame, I played a LOT of it. And then, pretty much as I had finished my first play through, out comes the DLC. Let’s ignore for a second how much of a money grab it is to have DLC come out this soon after release… I can really only take so much shoot’n’loot. I need some DOA 5. Maybe some Max Payne 3, which has been sitting collecting virtual dust in my Steam account. Borderlands 2, you’ve got this going for you… you scratch a co-op itch that few games can. So maybe I’ll still throw you a little action on the side ;). I feel the same way. Since I got Borderlands 2, I have also gotten Doom 3 BFG Edition, DMC Collection, DIshonored, ACR (Only cause I am getting AC3) and have made very little progress in all of them. 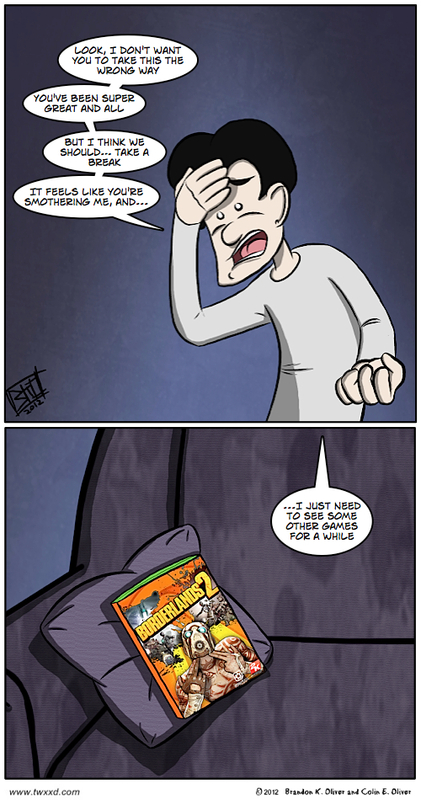 Borderlands is a curse to Shooter’s. It drags you back in at every moment… Gearbox you foul Mage. What curse have you put on us as gamers?! It’s the quest for more loot. I want more guns: better guns, stronger guns, faster guns, SHINIER GUNS. Oh god, it’s happening again. Don’t let me go back to her again. I didn’t really get into the first one. How is this one compared? You either got completely into it or you didn’t. More insane guns, more addictive, more thought put into the story, in my opinion. I think my problem was picking the big slow guy who uses shotguns. Also I have AIDS. I had this moment with Skyrim. We kept hooking up after that though, sometimes for weeks at a time. We’d go all night, y’know? When it’s that good, you always end up going back for more. If you haven’t gotten into Dishonored, I’d recommend that now. I enjoyed Borderlands alright, but the Diablo 3 style kill stuff for more guns gets tedious after a while. I liked the weird little stories, and once that ran out I was done. If you like old school stuff, then Double Dragon Neon is a pretty sweet re imagining. Cheap too. I’ve always been somewhat interested in trying a Professor Layton game, so I’m planning to pick up the 3DS one that hits on Sunday. Okami HD comes out soon too, Tuesday on PSN. I’m thinking of checking that out. Then Paper Mario and the next episode of Tell Tale’s Walking Dead, and I want to try to get a Wii U and…yea. I’ve got problems. Dishonored is the next big one I want to get for sure. I played the demo for Double Dragon Neon and it looks awesome. Oh god, based on that list, I think we both have TMGS (Too Many Game Syndrome). Maybe we should talk. Didn’t this game come out like 3 weeks ago? And you need to move on to another one already? I completed this as the gunzerker over the weekend. I loved this one a lot more than the first (then again, my opinion, this one has something resembling an actual plot).